The Concept2 Model E Indoor Rowing Machine is designed to deliver a total body workout for individuals of all ages and all fitness levels. With a flywheel that is designed to maximize the smooth feel of each stroke and minimize the noise of the machine when in operation, this is the perfect piece of equipment for the home. Concept2 has even taken the time to make the unit as portable as possible, with a frame that separates into two parts and caster wheels that make transport as easy as possible. Priced at $1260 on Amazon.com, this top-of-the-market rower does not skimp on quality, durability or features. If you are trying to compare several different indoor rowing machines, read this honest review of the Concept2 Model E Indoor Rowing Machine Review and decide if this is the right buy. 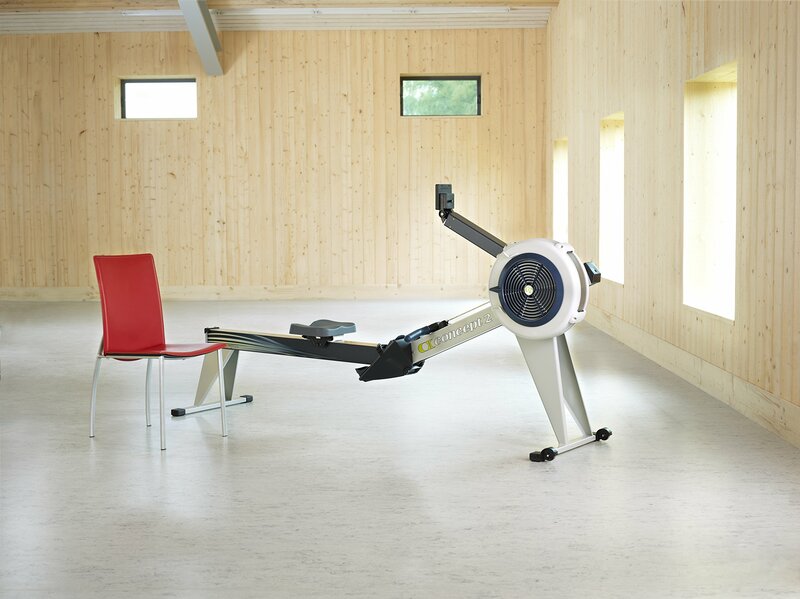 The Model E is a unique rower because its frame sits off of the floor at a height of 20 inches, which is similar to the height of a kitchen chair. The purpose of the frame height is to make it easier for individuals with mobility and balance issues to get on and off of the machine. If you have an aching back, tired knees, or any other ailments, the Model E is one of the few machines that is designed for you. It will still deliver you a full body workout while you follow a rhythmic and natural rowing motion and work the back, abs, legs, arms and chest. While the product is great for people who are rehabilitating, it is also perfect for users who want to get in shape, maintain, lose weight or cross-train. If you are looking for a rowing machine that will not disturb the household, that is another positive feature of the Model E. The flywheel does not only make it feel like you are rowing over calm waters, it is also very quiet in operation. If space is a concern of yours, the machine will take up 9-feet x 4-feet when in use, but can be split into two different parts shrinking down to 27-inches x 47-inches x 54-inches when ready for storage. While the machine is capable of holding users up to 500 pounds, it only weighs 65 pounds and comes with caster wheels for easy single person portability. This is a great unit for a home where space is limited. There is no shortage of features that will help you track your performance and keep you entertained. The Model E has an advanced performance monitor that will track your data from every row so that you can see if you are improving. It also includes a heart monitor and chest belt so that you can track calories burned. If you are the type who likes to play games to stay motivated, the PM4 monitor has pre-programmed games that you can play as you row. Concept2 has a great reputation in the home gym equipment marketing, and this rower has a great reputation as well. With a durable nickle-plated frame, a smooth flywheel and a frame that sits off of the floor, individuals who want a machine that will last several years and help deliver a quality workout will get what they are paying for. While there are a few cons, the pros definitely outshine these. Consider the features you are looking for and decide if the Concept2 Model E Indoor Rowing Machine is right for you.